The phrase “The best laid plans of mice and men often go awry” is familiar to all of us. It recognizes uncertainty in our knowledge of the world. However, technology is starting to allow us to develop more robust and flexible plans that mean we can make better-informed decisions and are less likely to be caught out by the mythical “Murphy’s Law.” As an example, consider navigation. Not that many years ago, on a route you drove regularly, you would get to know the traffic patterns and, as an expert in that route, be able to avoid difficult times, be aware of unusually high traffic volumes and make good decisions about taking an alternative route. However, on an unfamiliar route you had to study an out-of-date paper map (noting that there are varying levels of competence in map reading), jot down some directions and hope for the best with traffic. Then along came GPS, and finding your way became easy. Negotiating traffic was still a lottery. Now we have live traffic information, and our phones give us options on our route, predicting the best one, and even update the predictions of the optimum route as we drive. So nobody will ever get stuck in traffic and be late for a meeting again! The emphasis being on the reliability of the predictions made available to us, and our ability to make an improved choice. I believe there is a lesson for the pipeline industry here. We have multiple threats to tackle, ranging from organizational issues with systems and competence to the maybe more recognizable technical threats such as external interference, ground movement, corrosion and cracking. It takes years to build expertise in each of these areas; the industry guidance documents we have, the “maps” are of course generic and quickly become out of date. However, we have data on where threats occur, how problems develop and what has worked in particular situations. Let’s take the common threat of corrosion as an example. Safely managing the threat of corrosion with the many different causes and variability in growth rates remains a major challenge for industry. In the world of pipelines, we rely heavily on a combination of internal inspection, monitoring devices, process control and, of course, experts who guide us. Where there is good information on operation, product environment and historical corrosion, experts can give us good estimates of future growth and provide proactive recommendations to tackle a myriad of corrosion problems. However, while experts have a good understanding of the issues in many cases, they may have limited information directly relevant to a particular situation and will then find it difficult to give good guidance. The consequence: to counter residual uncertainty, conservative approaches are taken, and these lead to high costs, for example in terms of excavations or corrosion inhibitor injection. So, while the combination of technology and expertise has allowed the industry to substantially reduce the number of leaks due to corrosion, even with an expanding and aging network, challenges remain as failures still occur, and budgets may not be deployed as effectively as they could be. Reducing unnecessary expenditure will release budget for other risk mitigation activities, increasing overall safety and reliability levels. So, we need better ways to predict where corrosion may grow rapidly and where it will remain at a low level. Considering the navigation example given above, we need an accurate map that tells us where we are and which way to go, even if we encounter areas that we are not familiar with. It is now possible to create this digital map for pipeline corrosion management. In-line inspection has created vast volumes of data on the location and severity of internal and external corrosion affecting pipelines around the world. When combining this with data on the age, design, environment and operation of the pipelines, it becomes possible to create a digital record of the corrosion patterns and growth rates seen in many thousands of pipelines. Using these data sets for the application of machine learning techniques, such as the boosted decision tree, can dramatically improve predictions and provide enhanced decision support. 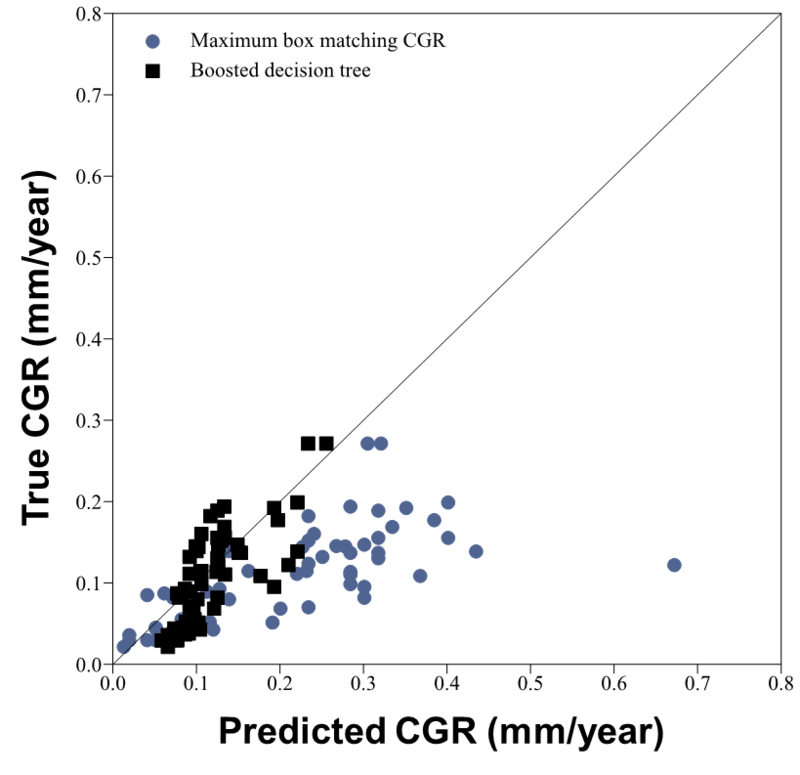 The figure below illustrates an example of a case study to improve the accuracy of corrosion growth rates from simple box matching [Reference: Smith et al. IPC 2018 Pipeline Data Analytics – Enhanced Corrosion Growth Assessment through Machine Learning]. This developing area of integrity analytics applying big data and artificial intelligence techniques is allowing us to identify broad trends and patterns in large data sets and create highly focused solutions for specific problems with smaller, very high-quality data sets. The result is that we can quickly analyze corrosion identified in a pipeline by a new inspection and make much more reliable predictions about the future increase in depth and extent of that corrosion than were possible in the past. The industry must adopt these predictive methods so that they can be improved as a part of the continuous improvement cycle that is the key to reducing leak rates, optimizing expenditure to ensure that the best value in terms of reliability and safety is gained from integrity management expenditure, particularly with an ever-expanding and aging worldwide pipeline network. To gain the maximum benefit from these integrity analytics techniques, there are some prerequisites. The first is that, as an industry, we have to be prepared to put in the efforts required to collect good-quality data, both on the condition of our pipelines and the operation, that is the product composition, the pressures and temperatures of operation, the flow regimes, the environment, the materials etc. The second is that we must be ready to anonymously share data between operators so that all can benefit from the larger pool. Finally, we must all diligently take advantage of the information we share and reap the benefits in terms of improved safety, longer asset life and optimized costs. The technology is there (or on its way), the data can be collected, the knowledge is there – let’s put it all together!